5* Metaphor ..Charles Hugh Smith* compares America to the Titanic - "Our money, our government, our Social Security, our Medicare and our entire debt-based way of life is mighty and invulnerable. Those few who see the eventual need to prepare 'risky' lifeboats are mocked and ridiculed. But the status quo's bow is already sinking into the ice-cold waters of reality. The only way the status quo can support the debt-based financial system and government that funds all these vast systems is if the economy creates 10 million more 'breadwinner' jobs (in David Stockman's definition, a job that earns enough to support a family of four) a decade .. Now that software and robotics are commoditized, the scarcity value of these tools and the goods they produce is plummeting. Take a look at profits in commoditized goods: they're razor-thin, and getting thinner by the day. As the cost of software/automation tools drops, they become affordable to an ever-larger pool of owners/producers, which means the competition from new owners will increase until there is no profit at all. 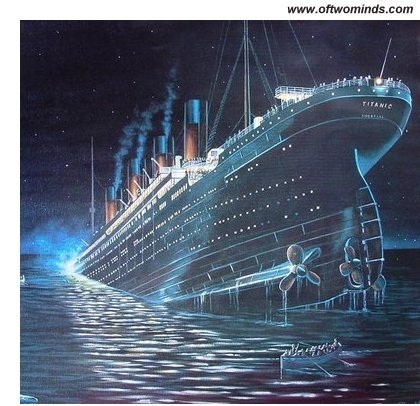 The belief in the status quo's permanence is exactly like the belief in the Titanic's invulnerability. The systems we depend on are so vast and seem so mighty, it doesn't seem possible that they could unravel and fail. But their eventual unraveling and failure are already baked in and cannot be undone by the modest tweaks of what passes for 'reform' in the status quo. The financial realities of systemically stagnant jobs, incomes and tax revenues have already ripped a fatal gash below the waterline of the status quo. The bow is sinking but the parties on the First Class deck continue. The passengers in steerage are getting anxious because they see the cold water sloshing around the lower decks, but few on the upper decks care what mere steerage passengers are experiencing. Unfortunately for those partying on the upper First Class decks, they are as doomed as the steerage passengers when the ship goes down."